With Black Friday a confirmed success, and Cyber Monday by all indications a blockbuster as well, Amazon.com (AMZN) is off to the races. It's beginning to look a lot like Christmas for the cyber retailer and its shareholders. One analyst projects the company will grow at better than 30% per year through 2013. There's just one problem for new investors looking to profit from this amazing phenomenon: the stock price. 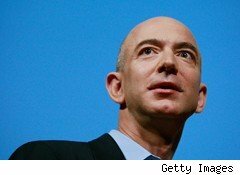 At more than 100 times annual earnings, a share of Amazon.com is anything but a bargain. And while the high price is great news for folks who bought the stock way back when, it does pose a dilemma for stock shoppers: We know Amazon's business is going great guns, but how do we participate in its success without overpaying? Actually, it's easier than you think to get a piece of the action at Amazon. Stop and think about Amazon's business model for a moment. How is it, exactly, that Amazon transforms an order you type in on your home computer into a smile-emblazoned package on your doorstep -- all in as little as 48 hours? There are at least three distinct steps involved. Let's take a look. While it's theoretically possible to pay for things on Amazon using your checking account, I suspect most of us take the default option. We pay our Amazon bills with a credit (or debit) card -- MasterCard (MA) or Visa (V), American Express or Discover. It's convenient as a mouse click, but don't forget -- every time you click that mouse, the credit card company collects a fee. It's a small fee, but the more the mouse clicks, the more the money adds up. Last year, MasterCard collected $6.4 billion from operating its tollgate business (not all from Amazon, but enough). Visa notched a cool $9.2 billion. More important than the gross figures, though, is what they add up to for investors. At roughly 21 times earnings apiece, a share of either MasterCard or Visa offers you a way to participate in Amazon's sales success, but pay a P/E ratio just one-fifth of what a share of Amazon will cost you. If you're a true bargain hunter, take a look at AmEx (AXP) or Discover (DFS), which trade for just 12.2 times and 6.5 times earnings, respectively. My next two stocks riding Amazon's coattails also come in paired form: FedEx (FDX) and UPS (UPS). Sure, once you've bought an item on Amazon, it may arrive at your doorstep courtesy of your friendly neighborhood postman. (Though judging from the headlines, he loses money on every delivery he makes.) More often than not, though, it's the low rumble of a big white FedEx or brown UPS truck that announces your package's arrival. With these two companies, investors get two new ways to invest in Amazonian growth. Of the two, FedEx is the slightly cheaper option, while UPS pays the better dividend (2.9%). Either way, at 17 times earnings each, the stocks offer bargain-priced alternatives to investing in Amazon itself. I have a question for you now. Once FedEx or UPS has delivered you a package from Amazon, have you ever looked at the box? I mean really looked at the box? You should. Now turn that box upside-down, and look for a circular stamp, about 2 inches in diameter. If you find one, chances are it's going to tell you that the box was manufactured by a publicly traded box maker. It could be Rock-Tenn (RKT), Sonoco Products (SON), Packaging Corp. (PKG), or Temple-Inland (TIN) (soon to be International Paper). Whichever company it is, I can tell you one thing for sure: It trades for less than a 100 P/E ratio. Buying box makers isn't usually at the top of most investors' wish lists, you see, and with lack of interest comes lower stock prices. Packaging Corp. and Sonoco shares both cost less than 15 times earnings, which makes them two of the cheapest "Amazon plays" we've looked at so far. Rock-Tenn doesn't cost much more, at roughly 20 times earnings. And all four of these stocks manage to pay a nice dividend yield, to boot, which is a trick even Amazon hasn't managed just yet. Just goes to show you: There's more than one way to skin a cat ... and at least 10 good ways to invest in Amazon.com on the cheap. Editors note: While these companies admittedly do not receive a large portion of their income from Amazon, they are intrinsically linked to the online retail revolution. While Amazon is not the only player in this field, their growth can be considered a proxy for the shift in consumer spending habits toward more online purchases. Motley Fool contributor Rich Smith does not own shares of any companies named above. The Motley Fool owns shares of FedEx, Rock-Tenn, United Parcel Service, and MasterCard. Motley Fool newsletter services have recommended buying shares of Visa, Amazon.com, and FedEx. Motley Fool newsletter services have recommended creating a write covered strangle position in American Express.